As part of a delegation of educationalists, Bridgend College was invited to join Colegau Cymru for a visit to Sonderberg in Denmark. The purpose of the trip was to to explore Denmark’s strategy for the delivery of higher level skills in Vocational Education and Training (VET). Folkeskole is a comprehensive, integrated municipal school covering primary and lower secondary education without streaming. Education is compulsory for ten years (up to Grade 9) starting from the year the child turns six (Grade 0) – it is important to note that education is compulsory in Denmark and not ‘schooling’. Folkeskole also has an optional grade 10. In the 2014/2015, 51% of pupils having attended Grade 9 also attended Grade 10. VET includes more than 100 main programmes leading to almost 300 different qualifications at level 3 to 5 in the Danish qualification framework. The duration varies from 2 to 5½ years, the most typical being 3½ to 4 years. Twelve Land-based students from Animal Studies, Agriculture, and Equine Studies were lucky enough to be selected for a two week work placement at Hansenberg College in Kolding, Denmark. The Erasmus + funded project allowed students to experience working within another country, another culture and to widen their experiences of land based practices. 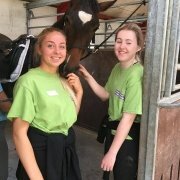 The equine unit at Hansenberg specialise in breeding competition level warmblood horses; the agriculture unit specialise with a herd of Jersey dairy cows, and the animal care unit have a mini zoo, veterinary centre and animal technician training facility. In contrast to their home studies where they take part in all aspects of their subject areas, this experience allowed the students to develop their skills and knowledge of more specialist techniques and work with a wider range of species. The aim of this Erasmus Plus funded project is for participants to experience a vocational subject area and conduct work experience in a different European country. Due to the decline in the Welsh PISA results over the last decade in Wales, which has caused great concern and resulted in extensive research and increased development of initiatives for improval, a group of 10 CACHE students and 4 lecturers chose to look at an alternative approach to Literacy and Numeracy within an Early Years setting at educational institutions and businesses in Clermont-Ferrand in France. 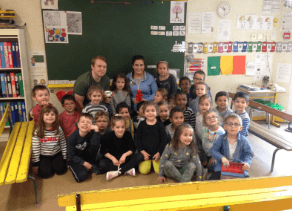 Over their 10 day visit, the participants spent most of their time working at a French Early Years nursery observing and participating in daily activities and paying particular attention to key educational approaches such as active involvement ,differentiation and assessment for learning. This enabled them not only to gain valuable work experience at a professional childcare setting, but also allowed them to visit the further education college where their peers were studying and learn more about the approach to FE education in France as well. Most of the participants are now progressing onto HE education at University to study Primary Education so the intention was for them to reflect on the French principles they researched and then to cascade their findings to peers and into settings on their return to Wales. As a result of this visit, the CACHE team have now devised an early years ‘baby care’ role play area within the faculty as this was one of the things that they saw in action in France which they felt would be beneficial for our students at Bridgend College. Bridgend College is delighted to announce its new strategic partnership with Lovedale TVET College in the Eastern Cape of South Africa. Funded by the British Council, the colleges will work in partnership to investigate ways of working closely with local and national businesses. “Lovedale trains students in a variety of areas such as business, engineering, art and agriculture. Curricula for these are regulated, so development done within the college must focus on adding skills for employability. All learners are supported by the provision of a period of practical experience which, in some cases, is a necessary part of the completion of their qualification. A major reason for widening employer engagement is also to provide avenues for the experiential training of learners. 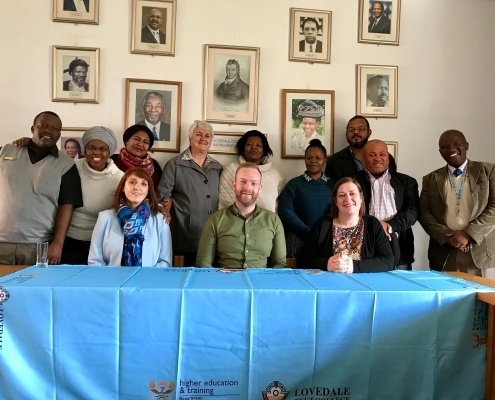 Over the half term period, Viv Buckley, Joseph Baldwin and Denise Brookes-Cooze undertook a visit to Lovedale TVET College in the Eastern Cape. From 7 to 11 May 2018, Bridgend College was delighted to host 3 visitors from Lovedale College. Lizzy, Juanita and Glen are all members of the Lovedale management team and visited to observe first hand how Further Education Institutions in South Wales are engaging with local businesses. The visit began with a cultural/historical tour of the surrounding areas to locate the College in the wider context of South Wales. The rest of the week saw our guests take part in Digital Continuing Professional Development (CPD) and visit local employers including Ford and Tata Steel to see our employer links in action. A day was also spent at our Queens Road Campus with the Work-based Learning Team and Enterprise Manager, Ruth Rowe. 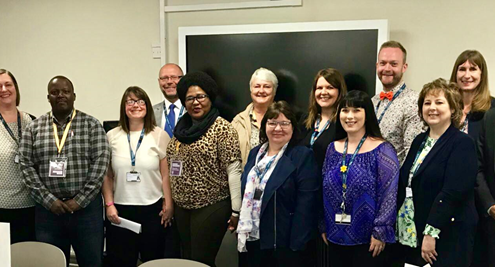 This Appreciative Enquiry led to a rich feedback session, where our new colleagues attended a meeting of our senior managers and provided feedback on their visit. It was lovely to hear that they had received the traditional warm welcome from all, and fascinating to hear reflections on the open and honest conversations they had enjoyed with members of staff from all areas of the the College. Guests also shared their thoughts on our operational procedures and culture of learning.